It will soon be time to get out and enjoy spring-like weather……. Sheffield Neighborhood News is the publication of the Sheffield Neighborhood Association (SNA), a community organization representing the commercial, industrial and residential constituencies in the area bounded by Halsted on the east, the Chicago River on the west, Fullerton on the north, and Armitage on the south. The address of SNA is 2233 N. Kenmore, Chicago, IL 60614; e-mail, info@sheffieldneighborhood.org. Current SNA Board Members can be viewed by clicking here. Committees are listed here. 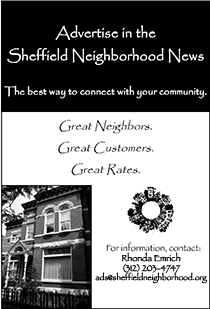 Items to be considered for the Sheffield Neighborhood News should be sent to: Jay Becker, Editor, SNA, 2233 N. Kenmore, Chicago, IL 60614.